How does a country boy from tiny Bilboa, North Carolina find himself an apprentice to one of the greatest songwriters in country music? Ever heard of Bilboa? Yes, it’s that small. But you’ve heard of Harlan Howard, right? “I Fall to Pieces?” THAT Harlan Howard. Brian Davis isn’t one to push himself or his music on someone. It just isn’t his style. Fortunately, what is his style is writing great rockers and party anthems full of hot screaming guitar, booming bass and thumping drums. Sometimes. On the other hand, his style is also writing emotive ballads laden with picturesque lyrics that twist and turn phrases to carry the listener on a musical journey of their own or Brian’s life. Those…those are best interpreted by Brian’s pure masculine baritone and an acoustic guitar. So, it’s really not a case of having to force himself on anyone. It’s more like, “If you build it, they will come.” If you write great songs, make great music and sing from your heart, they will come. And they have most definitely come. From playing all over his home state of North Carolina, to opening for pal and frequent co-writer Brantley Gilbert on the Hell On Wheels tour—last year and this year, Brian has taken his brand of rockin’ country music from a regional to a national level. His Tarheel fans are sitting back enjoying knowing that they saw the evolution of one of the hottest new artists in the format, while new fans are digging voraciously into his catalog that is already six albums deep. High Valley keeps in line with traditional country sounds while they explore Americana, rock and pop influences in their major-label debut album, Dear Life. Tracks of inspiration, desires of the heart and their journey as musicians make up the record. The 11-track project experiments with a variety of beats and guitar picking that keep the music interesting while they share their pitch-perfect harmonies. Production elements blend genres to create foot-tapping beats and melodies that replay through your head all day. High Valley make their own sound that will stand out on country radio while staying in touch with country roots that serve as each tune’s platform. The Canadian country group’s lead single, “Make You Mine,” has the most interesting sound on the album. It sticks out among the rest and will draw intrigued listeners into explore what other stories the duo has to offer. “Dear Life,” the title track, shares feelings about making choices while growing up. Its message will resonate with much of their audience and may be representative where they are in their own life. It follows similar patterns as surrounding tracks, including heavy drums that bring the song to life. “The Only” and “She’s With Me” have comparable themes of adoration. Their obvious pop influences match the song’s tone with complimenting faster-tempo beats. The featured repetitive hooks just about guarantee them stuck in your head all day as you fight the urge to dance along. Americana influence is heaviest in the No. 8 title, “I Be U Be.” The back-and forth nature of the song has hints of tribal elements as strong imagery describes an ideal love scenario. Just as many other included tracks, “I Be U Be” stays clear of electric guitar solos and focuses on percussion and diction, a factor that might become a signature in their career. The closing track, “Young Forever” has a similar vibe that compares to Billy Currington’s “We Are Tonight.” The embrace-the-moment trend adds a brightness to the album that contributes to its already high-spirited qualities. Emotional tracks intertwined with flirty fun songs lead to this diverse album. Dear Life is an exciting piece of art that serves as a solid platform for the bright career they have ahead of them. Following the birth of he and wife Catherine’s long-hoped-for children (twins born in December 2015), the singer-songwriter found his world turned upside down. The mark he wanted to leave and things he wanted to say had changed, and despite an early version of Fighter being already finished, he decided to record four new songs, completely changing the project’s tone. In short, Nail decided to get real in a way he never would have allowed himself before. Already known for powerful, emotionally-charged vocals, he took the same approach to choosing Fighter’s 11 tracks (seven of which were written or co-written by Nail himself), celebrating life’s victories but also exposing the knock-downs he’s endured – and it wasn’t always flattering. Writing and singing in courageous personal detail, Nail confronted some of his deepest troubles, revealing the clarity he’s achieved about his hometown, the true struggle depression caused in his marriage, the answered-prayer of his children’s birth and the things he never told his own father. Meanwhile, producer Frank Liddell (who also guided Nail’s first three albums, I’m About to Come Alive, The Sound of a Million Dreams and I’m a Fire) made sure Fighter’s musical tone was just as authentic, backing Nail’s volcanic vocals with a melting pot of Mississippi-delta sounds — a mix of classic-country balladry and sweaty Memphis soul, with touches of in-the-moment modernity sprinkled throughout. Big-name collaborations abound, with Nail inviting Vince Gill, Brothers Osborne, Lori McKenna and Logan Brill to help tell his story, as well as Bear and Bo Rinehart of NEEDTOBREATE. Brothers Osborne kick the project off in star-crossed revelry on “Good at Tonight,” McKenna joins “Home” to quietly uncover Nail’s love/hate relationship with his hometown, Gill adds stunning harmony vocals to the country-soul “I Won’t Let You Go” – a promise to David’s wife Catherine – and the Rineharts help close the album in tender admiration with “Old Man’s Symphony,” an overdue thank-you note to Nail’s dad. Along the way, he toasts to the passion of youth in the upbeat hit “Night’s On Fire,” pledges romantic relief in the raw Chris Stapleton co-write “Ease Your Pain,” delivers a desperate double entendre in the indie-rocking “Lie With Me” and crafts a loving, rock-a-bye origin story for his new family in “Babies” – an instant classic. Then there’s the project’s title track, “Fighter,” a heartfelt ‘80s-country throwback ripped from Nail’s real life that holds his wife up as an unshakable supporter – even when he was at his worst. Nail and Catherine have had to fight their whole lives, he explains – for his career, for their marriage, to battle back inner demons and to conceive their beautiful kids – but their ultimate success in those battles has led them to a better place. And it also gave the album a mission. Fighter is more than a bookmark in Nail’s life and career – it’s a period on the final sentence of a difficult chapter. Penned during dark times that have given way to a new sunrise, these are some of the most meaningful and personal songs he’s ever recorded. And now that they exist for all to hear, he can finally move on. Michael Ray Roach (born April 29, 1988), best known as Michael Ray, is an American country music singer and songwriter. He is signed to Warner Music Nashville, for which he has released his debut single, “Kiss You in the Morning“. The song has reached No. 1 on Country Airplay. Before this single’s release, Ray was mentored by John Rich of Big & Rich on the singing competition The Next: Fame Is at Your Doorstep, which he won. He and Rich co-wrote Big & Rich’s 2015 single, “Run Away with You“. In March 2017, it was reported that Ray would put his acting chops to the test when he revealed that he landed a guest role on CMT’s show, Nashville. Love and Theft is an American country music group founded by Stephen Barker Liles, Eric Gunderson, and Brian Bandas, all three of whom alternated as lead singers and acoustic guiarists. Signed to Lyric Street Records subsidiary Carolwood Records in 2009, Love and Theft made their chart debut in early 2009 with the single “Runaway,” which reached the Top 10 on Billboard Hot Country Songs. The band’s debut album, World Wide Open, was released on August 25, 2009. In 2011, following the departure of Bandas, Love and Theft continued as a duo consisting of Gunderson and Liles. The duo moved to RCA Records Nashville that year and released the single “Angel Eyes“, which became their first number 1 single. It and the Top 40 singles “Runnin’ Out of Air” and “If You Ever Get Lonely” all appear on their second, self-titled album. Devin Dawson is an American country music singer-songwriter. Devin Dawson first became famous after filming a mashup of Taylor Swift songs, which gained popularity on YouTube. His debut single “All on Me” is also his first hit song. With the help of producer Jay Joyce, he signed to Warner Bros. Records in 2017. Dawson’s “All on Me” has charted on the Hot Country Songs and Country Airplay charts. Dawson has also toured with Tim McGraw and Faith Hill. Three Great Artist one Night of Music!! Somewhere in the midst of 10,000 towns, along a lonely highway between packing clubs in their native Texas years ago and more recently performing stadiums on one of country music’s hottest tours, the Eli Young Band became more than a band. They became a brotherhood. Camaraderie and creativity fused into an intoxicating cocktail that has propelled the talented foursome to the vanguard of contemporary country music. It’s an exciting time to be LOCASH these days. That might very well be one of the biggest understatements in Nashville. Already in their career, the duo of Preston Brust and Chris Lucas have enjoyed hit singles, sold-out concert appearances here and abroad, and have tasted the top of the chart as two of Nashville’s quickest-rising songwriters. But, to quote the old saying… You Ain’t Seen Nothing Yet. Recently signed to Reviver Records, the duo is joining forces with some of the biggest names on the Country Music business landscape. Brust says they could feel the team’s energy from the first meeting. “We haven’t felt an energy like this since the day we began our journey. This feels like it has all come together –the right label head, the right promo team, it finally feels like we’ve got all of our ducks in a row for the first time in our lives. We’ve been out there doing the grass roots thing for so long, and to feel it all come together, is so encouraging. It may be a ballsy move for The Cadillac Three to name their new album LEGACY, but if any country band has the shared history to lay claim to such a weighty title, it’s the longhaired trio of Nashville natives. Singer-guitarist Jaren Johnston, drummer Neil Mason and lap-steel player Kelby Ray have known one another since they were teens and have been sharing stages together for nearly 15 years. This summer, they’ll headline their hometown’s most famous venue, the Ryman Auditorium, just a few blocks from where Johnston and Ray sat in high-school math class daydreaming about one day playing the legendary hall. Johnston’s connection to the Ryman goes back even further: his father has been a drummer at the Grand Ole Opry since Jaren was a child. And now he has a son of his own, who, like his old man, will be well-versed in all the sounds that make up both Music City and The Cadillac Three, from country and blues to rock & roll. So, yeah, “legacy” looks good on this band. After nearly a full year on the road in support of 2016’s BURY ME IN MY BOOTS, their first full-length album recorded for Big Machine Records, the group returns with a more mature perspective. Johnston, Mason and Ray have experienced a lot on tour, whether opening arenas across the country on Florida Georgia Line’s Dig Your Roots Tour or headlining their own consistently sold-out string of sweaty club and theater shows in the U.K. and Europe. As they prepare to head back in November for another big run, for The Cadillac Three, the old saying really is true: this band is huge overseas. All that travel, from city to state, country to continent, could decimate a lesser band, but it only served to creatively inspire the mighty TC3. They wrote many of the 11 songs that make upLEGACY on the road, cut the tracks on rare days off in Nashville and then recorded all of Johnston’s vocals – one of the most “country” voices in the genre – in the back lounge of their bus in between shows, adding a crackling sense of vitality to LEGACY. They also produced the album themselves. That back-to-basics approach to making music yielded the band’s most infectious single to date: the woozy sing-along “Dang If We Didn’t.” Written, as is most of the album, by Johnston and Mason (here, with Jonathan Singleton; other times with songwriters like Laura Veltz and Angelo Petraglia), “Dang If We Didn’t” teases fans with its ambiguous title, before revealing what the guys actually did in the chorus: get drunk last night. The constant throughout LEGACY, however, lies in the players: as on all three of The Cadillac Three’s albums, only Johnston, Mason and Ray are the musicians. There’s no guest keyboard player, no second percussionist and certainly no bassist. Ray holds down the low end on his lap steel. Especially on the standout LEGACY track “Take Me to the Bottom,” which features Johnston reaching high for a breathtaking falsetto. “‘Take Me to the Bottom’ has the best bass sound of anything I’ve ever done,” says Ray, who also keeps things greasy on the intense “Tennessee.” A thrashing love song, it evokes the stomp of ZZ Top – a favorite of TC3 – and features a lyrical shout-out to progressive country hero Sturgill Simpson, a kindred spirit of the band. Honesty, or authenticity, is a favorite buzzword around Nashville. But few artists come to it as naturally as The Cadillac Three. These guys couldn’t fake it if they tried. In the album’s title track, they offer a heart-on-the-sleeve testimony to what’s really important at the end of one’s days: love and a family tree. When Mason and Ray heard “Legacy,” co-written by Johnston, they flipped, and pushed for it to be the title of the record. “We’re far enough along in our careers where doing an album called LEGACY doesn’t feel presumptuous to me,” says Mason. Not when you run through The Cadillac Three’s milestones. It’s all there, from boundary-pushing albums, Grammy-nominated No. 1 songwriting across genres and fan-favorite singles to sold-out club shows and massive festival gigs alongside Aerosmith. Randy Houser will be performing live at The Bluestone on May 10th, 2018! Country singer and songwriter Randy Houser was born and raised in Lake, Mississippi, where his love of music was apparent even as a young child. Houser started fronting bands when he was around 13 years old, and continued playing local gigs all the way through high school. While attending East Central Community College in Decatur, Mississippi, he realized playing music had its financial rewards as well, and he began working on his songwriting. He also formed 10lb. Biscuit, and the band was well received on the local circuit. A Thousand Horses live at The Bluestone on June 14th, 2018! America’s bona fide band of brothers A Thousand Horses deliver an authentic fusion of Southern rock and contemporary Country mixed with rowdy jams. Their 13-track project BRIDGES features working man’s anthem “Preachin’ to the Choir” along with seven acoustic tracks, six of which were recorded live in the U.K. at the famed Metropolis Studios. The group’s debut single “Smoke” made Country Aircheck history as the highest debut for a new artist and solidified the band (with at least three members) as the first this decade to score a #1 with their first single on the Billboard Country Airplay Chart. A Thousand Horses have landed multiple awards show nominations, most recently vying for the title of ACM New Vocal Duo or Group at the 52nd Annual ACM Awards. The band’s debut album, SOUTHERNALITY, blends Southern Rock and influential sounds of The Black Crowes and Rolling Stones’ Exile on Main Street era. The talented foursome soars with Michael Hobby on lead vocals as Bill Satcher and Zach Brown on guitar and Graham Deloach on bass round out their unique grooves. After opening for Country powerhouse Jason Aldean and a string of performances in the U.K. last fall, A Thousand Horses are currently headlining shows across the U.S. before kicking off their opening run on Kid Rock’s AMERICAN ROCK n ROLL TOUR 2018 in January. New music from the band is on the horizon, with details coming soon. For more information and tour dates, visit AThousandHorses.com. Chris Janson LIVE at The Bluestone on Thursday, June 21st, 2018! “Fix a Drink”, the lead single from his highly anticipated sophomore album Everybody, went Top 10 at country radio, though Janson is no stranger to the charts. In 2015, Chris Janson’s breakthrough No. 1 Platinum single “Buy Me A Boat” was the 7th bestselling country song of the year. The singer/songwriter has also penned multiple top-charting hits including “Truck Yeah” (Tim McGraw), “That’s How I’ll Always Be” (Tim McGraw), “I Love This Life” (LoCash), and over 25 additional hit songs recorded by a long list of established artists. Chris Janson joined Sam Hunt on the road for the 15 in a 30 Tour and announced The EVERYBODY Tour with headlining dates through 2017. He has become a Grand Ole Opry regular, taking the legendary stage more than 150 times to date, and made numerous television appearances including The Tonight Show starring Jimmy Fallon, Late Night with Seth Meyers, CONAN, The Today Show, ACM Awards and ACCA Awards. Joe Diffie was regarded by many of his peers as one of the better vocalists in contemporary country, and lent his traditional sensibilities to humorous, rock-tinged novelties and plaintive ballads. Diffie was born in Tulsa, Oklahoma, in 1958 and grew up in a musical family, first performing in public at age four with his aunt’s country band. He played in a rock band during high school, and later moved on to a gospel quartet and, during college, a bluegrass band called the Special Edition. He worked on his songwriting and singing over the next few years while working in a foundry, and caught a break when his “Love on the Rocks” was recorded by Hank Thompson. When Randy Travis nearly recorded another of his songs, Diffie was convinced he had a shot in the business, and moved to Nashville in 1986. He took a job at the Gibson guitar plant while continuing to write songs, and became an in-demand demo singer as well. Holly Dunn’s 1989 recording of a Diffie collaboration, “There Goes My Heart Again,” proved a major hit, and Diffie found himself a hot commodity. He signed with Epic and released his debut album, A Thousand Winding Roads, in 1990. His first single, “Home,” went all the way to number one on the country charts, and “If the Devil Danced (In Empty Pockets)” duplicated that feat; meanwhile, two more singles from the album, “If You Want Me To” and “New Way (To Light Up an Old Flame),” reached number two. Diffie became a regular hitmaker over the rest of the ’90s, and scored again with his sophomore LP, 1992’s Regular Joe; “Is It Cold in Here” and “Ships That Don’t Come In” both made the Top Five. Known primarily for his ballads at this point in his career, Diffie switched things up with 1993’s Honky Tonk Attitude, which emphasized his rambunctious, rocking side and sense of humor, and proved to be his biggest-selling album yet. The title track, “Prop Me Up Beside the Jukebox (If I Die),” and “John Deere Green” all went Top Five. Sticking with engaging humor as the selling point of his hugely popular follow-up, 1994’s Third Rock from the Sun, Diffie scored two number ones with the title track and “Pickup Man,” plus a Top Five hit in “So Help Me Girl.” 1995 brought a holiday album, Mr. Christmas, as well as a proper release in Life’s So Funny, which gave Diffie his fifth number one hit in “Bigger Than the Beatles.” 1997’s Twice Upon a Time saw his commercial momentum slipping a bit, and so Epic issued a Greatest Hits compilation the following year; its new song, “Texas Sized Heartache,” returned Diffie to the Top Five. 1999’s A Night to Remember was the most straight-ahead, traditional country record Diffie had yet recorded, and it gave him two Top Ten hits in the title cut and “It’s Always Somethin’.” He returned to his more established style for 2001’s In Another World, which found him transferred to Sony’s reactivated Monument subsidiary; its title track went Top Ten early the next year. Tougher Than Nails followed in 2004, then in 2010 Diffie returned to bluegrass for Homecoming: The Bluegrass Album, which was released by Rounder Records and was greeted by warm reviews. Drake White and The Big Fire live at The Bluestone on August 2nd, 2018! Dillon Carmichael LIVE at The Bluestone on August 10th, 2018! Tickets On-Sale July, 6th 2018 at 10AM! REMEMBER WHEN COUNTRY SONGS USED TO SAY SOMETHING? The heartfelt sentiments are ones that Carmichael knows all too well, as it describes his own hometown – in the heart of metropolitan Mercer County, Kentucky. “I grew up on the lake which was created as a hydro-electric energy plant in a town called Burgin, Kentucky. The population has grown over the years to a whopping one thousand.” The town – at the intersection of Kentucky State Routes 33 and 152 – lives up to his description. “It’s a lake town, and everyone there works at the power plant. The school is there all in one building – from kindergarten all the way to twelfth grade. There was a baseball team and a softball team, but not enough to field a football team,” he says with a smile. In 2012, Dillon – who also cited Vern Gosdin, Waylon Jennings, and Merle Haggard as influences – decided to roll the dice, and haul himself and his belongings down Interstate 65 to move to Nashville. He says it took some getting used to. “Made To Be A Country Boy” is the first single from Dillon, and one that teamed him up with Grammy-winning producer Dave Cobb (Chris Stapleton, Strurgill Simpson). He says that Cobb allowed him to approach recording the old-fashioned way, which he prefers. “I prefer having a live band in the studio rather than bringing in just one instrument at a time to record a part. Sometimes, you’ll go back and you will hear something that might not be right the first time. Being in the studio is one of my favorite parts of the creative experience. The New York Times declares “…in the emergent field of gentleman country — an antidote to the bros of the last few years — William Michael Morgan stands tall.” The praise continues with his debut album VINYL, being hailed as a “sturdy, reflective debut album….a throwback to the temperate wisdom of midcareer George Strait.” The record, which opened in the Top 5 on Billboard’s Country Albums Chart, has landed him on countless year-end best album lists, including Rolling Stone, iTunes and Saving Country Music. His breakout mega-hit “I Met A Girl” has earned top song of the year nods from Billboard and NPR. The song topped charts and has garnered over a billion audience impressions, including over 25 million on-demand streams. Morgan recently released the title track as his third single. The tune harkens back to yesteryear with a modern twist. Aaron Lewis at The Bluestone Two Nights, BACK TO BACK! Lewis has been performing solo acoustic shows since he was 17 and still does today. He has written and performed many songs that have never been officially released such as “Angel”, “Something Like Me”, “Bonghits for Breakfast” (originally performed with J-CAT), and “Sleeping at the Wheel”. In July 2010, Lewis finished recording a country music EP entitled Town Line that was released March 1, 2011 on Stroudavarious Records. It features seven tracks including three versions of the first single “Country Boy” featuring George Jones, Charlie Daniels, and Chris Young, as well as the songs “Massachusetts”, “Vicious Circles”, “The Story Never Ends”, and a re-recording of “Tangled Up in You” originally from The Illusion of Progress. Lewis said in a July 2011 interview that he was introduced to country music as a child by his grandfather, but his interest was recently rekindled when he toured with fellow rock turned occasional country singer Kid Rock. Lewis released his first full solo album, The Road, in November 2012. Its debut single, “Endless Summer”, has also made the country charts. Lewis wrote every song on the 10 track collection, except for “Granddaddy’s Gun” which was penned by Dallas Davidson, Rhett Akins and Bobby Pinson, marking the first time Lewis has recorded outside material for an album. In an interview with Broadway’s Electric Barnyard, Lewis said he recorded “Granddaddy’s Gun” as both a compliment to a friend, and because he was pressed for time. Lewis wrote songs for his second solo album whilst touring in support of The Road, often performing the unreleased material in his live sets. The album, dubbed Sinner, was mostly recorded in a single 18 hour session, with many tracks done in one take. Aaron’s daughter Zoe also provides guest vocals on one song. It was released on September 16, 2016, with the lead single, “That Ain’t Country”, released on 17 June. Country artist Willie Nelson is featured on the album’s title track as well. 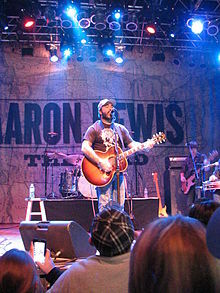 Aaron Lewis will be performing at The Bluestone Two Nights, BACK TO BACK! Ashley McBryde live at The Bluestone on November 8th, 2018 as part of her “Girl Going Nowhere Tour” performing live at The Bluestone on November 8th, 2018! Tickets On-Sale Friday, May 25th 10AM! “I hear the crowd, I look around, and I can’t find one empty chair. Not bad for a girl going nowhere” sings Ashley McBryde on “Girl Goin’ Nowhere,” the seminal title track from her forthcoming LP. They’re words built from experience: over the course of her life, McBryde’s been finding her own way to fill those seats and sway those hearts since the very first time her teacher told her that her dreams of writing songs in Nashville would never see the light of day. Every time she was brought down, she persevered; trusting her timeless tone and keen, unwavering eye for the truth. It paid off. In April, Eric Church brought her on stage and called her a “whiskey-drinking badass,” confessing that he’s a massive fan. The rest of the world is quickly catching on, too. Dubbed as one of Rolling Stone’s “Artists You Need To Know,” citing she’s “an Arkansas red-clay badass, with the swagger of Hank Jr. and the songwriting of Miranda Lambert,” McBryde fearlessly lays it all on the line, and it’s that honest all-in approach that has led to NPR critic Ann Powers to ask if McBryde could be “among the first post-Stapleton country stars?” McBryde’s album will showcase an artistic vision that will prove her to be one of the genre’s keenest working storytellers, bringing unwavering honesty back into a pop-preoccupied genre. Pulling tales from every corner of her human experience, McBryde sings with fire and fury, laughing and swigging that brown stuff along the way. McBryde was raised in Mammoth Spring, Arkansas. At three, she’d secretly pluck her father’s guitar like an upright bass, and after about the 17th time being caught, her father bought her a guitar of her own. When she was twelve, she played her parents and grandparents her very first composition. It was at Arkansas State when, while a member of the marching band, McBryde finally started sharing her voice with others, and finally moved to Nashville in 2007 where steadily worked a circuit of dive bars, biker hangouts, and colorful joints fighting to have her songs heard. Her first EP, the self-released 2016 Jalopies and Expensive Guitars was just a taste of what McBryde can do, and, on her full-length debut, she will meld her songwriting chops with the vision of producer Jay Joyce, peppering her tales with a touch of guitar-driven rock fury. McBryde isn’t afraid to tell the truth, get raw and real and use the spirits of country, folk and rock when it serves her greater purpose. And that’s to tell the stories that shake us, make us and tell us a little more about what it’s like to be human.